Quick, simple, tasty and easy to make – the perfect midweek dinner! It also works well garnished with any sort of grated cheese. 1. Cook the spaghetti as per the packet instructions and drain well. 2. Add the oil to a large pan set on a high heat and heat up for 1 minute. Add the onion, carrot, garlic and a pinch of salt (as this will help break down the carrot) and cook for 3 minutes, stirring regularly. Add the mushrooms and cook for 1½ minutes, then add the soy sauce and honey and cook for 3 minutes more. Add the lentils and tomatoes and bring to the boil, then reduce the heat to a simmer. 3. Roughly chop the basil, stalks included, and add three-quarters of it to the pan, leaving the rest for garnish. Taste and season the sauce with a pinch of salt and pepper if you think it needs it. 4. 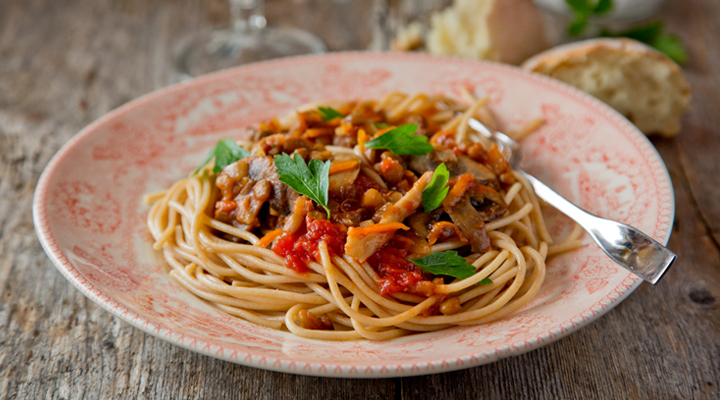 Plate up your dishes with the spaghetti on the bottom and the Bolognese sauce on top. Garnish with the remaining basil and some flaked almonds (they taste even better if you toast them in a hot dry pan for a few minutes).